When most people think of whisky, the striding man emblazoned on Johnnie Walker bottles comes to mind. The vast majority of people enjoy blended whisky in a mixed drink and, for this reason, Johnnie Walker will most likely be available in almost every bar, pub, restaurant, liquor store and grandparents dusty liquor cabinet. Taking heed of changes in the market, however, Johnnie Walker has seemingly sought to modernize its products with new bottle designs and some changes to its core line up which now include: Red Label, Black Label, Double Black, Gold Label Reserve (replacing Green Label), Platinum Label (replacing Gold Label), and, Blue Label. Each product in the Johnnie Walker core range offers something different, but perhaps one of the most interesting is the relatively new Double Black. The Johnnie Walker Double Black is described as a “rich, intense, smoky blend containing whisky matured in deep charred old oak casks”. 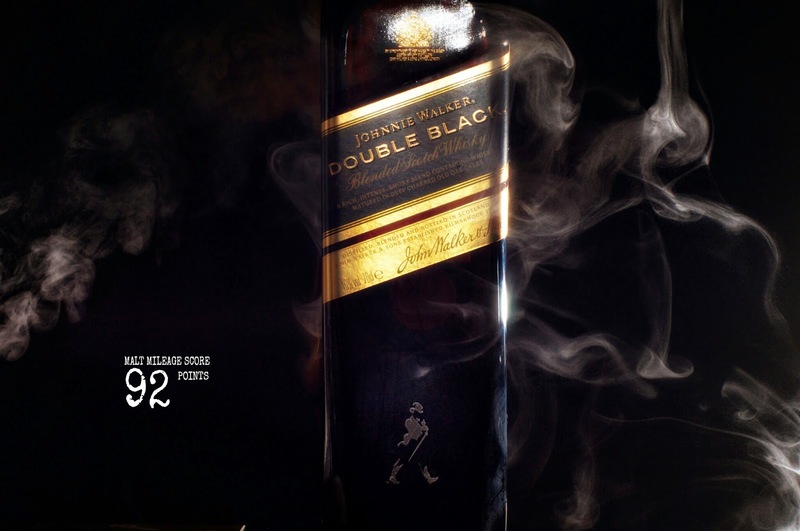 It is intended to be smokier and more intense than the Johnnie Walker Black Label and as a result Johnnie Walker appear to have created the Double Black for people who want more smoke, peat, ash and richness than the Black Label. The whisky itself is a masterful piece of blending, because in my opinion it has all the hallmarks of a deliciously smooth blend that should appease the mass market but at the same time bursts on the palate with rich malty flavours that single malt aficionados often admire in malts from the mainland and Islay – the luscious caramel, toffee, vanillas and chewy honeyed malt with hints of apple melds with ashy cigar smoke, spicy BBQ, mild medicinal notes, grassy peat and the mild spray of sea salt with a creamy, almost buttery, edge. At mid-palate the peat and the wood begin to intensity and eventually fade into a smoky, drying, finish with lingering sweet malt and toffee. Given the arsenal of single malts at the disposal of Diageo (the owners of Johnnie Walker), it is clear that the Double Black is very carefully crafted with malts from Islay at its core. The use of the heavily charred oak casks may also be masterstroke, because studies suggest that heavily charred oak tends to give a whisky more smoothing sweet vanillas. That is precisely what, in my opinion, makes the Double Black so delicious – the wood, spice, peat and sweet smoothing creaminess. The Double Black certainly boasts a rich flavour profile with smokier and more intense flavours than the Black Label, so in this regard Johnnie Walker have succeeded. At $50, it is great value and a fine example of a peaty whisky that has actually gained a creative edge thanks to the expertise of a blender. Looks like the Double Black will now sit comfortably in my whisky cabinet, waiting to be savoured on a frosty night when super smooth easy drinking peat is desired.